Wow. What a difference a year, or even a day makes with little ones! 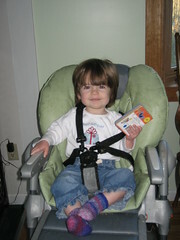 The chair doesn’t seem too big for you anymore, Lorelai! We’re on our toes all the time with you – as are you – two weekends ago you decided “I’m done with crawling.” and that’s it! You’re walking all over the place and you are fast! Thankfully, you are a great sleeper, a good eater and have handled getting so many teeth without too much fuss. You are also a crowd pleaser – with all the traveling on Christmas you would enter the room and stick close to me or Daddy, but then when you learned the lay of the land you just walked and walked and walked and made certain that people noticed you! 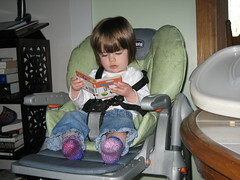 Even with all the toys / dolls you received for Christmas, reading a book still seems to be your favorite thing! And you’ve started to hold it right side up (which I’m very glad to see) – you love the Very Hungry Caterpillar, the Boynton books (snuggle puppy & doggies! ), Opposites with Oswald, this little nature book and a ladybug book. I hope you always love the books and I can’t wait until you can read the story to me! So much love for you kiddo! Many people have created lists in the past – frequently simple goals such as New Year’s resolutions. The key to beating procrastination is to set a deadline that is realistic. 1001 Days (about 2.75 years) is a better period of time than a year, because it allows you several seasons to complete the tasks, which is better for organising and timing some tasks such as overseas trips or outdoor activities. 5. 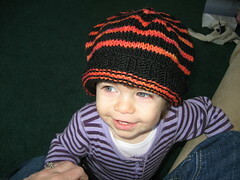 Make enough yarn on the drop spindle to make a hat. 7. Use crochet to make a simple amigurumi character. **Turkey & Brocolli Casserole thing from Taste Of Home Magazine. Not bad. **Mini Lamb Burgers with Couscous Salad from Real Simple – Delish! **Baked Mac-n-Cheese with Chicken Sausage from “6 o’clock Scramble” online – yummy! **Blueberry Cake from Cooking Light – ok, but all the blueberries sank to the bottom! **Blueberry Crumb Bars – not bad. 17. Drink 2-3 Liters of water a day. 18. Write a letter to Koji and Noriko to tell them about Lorelai. 19. Knit a sweater for me that fits and I love. Glee! 21. I want to make the “Heirloom Ring Blanket” for my mom. Deadline: December 2008. 27. Make my own granola. 31. Start doing yoga once a week, build up to three times a week. 33. Save $1 for every item completed from this list. 34. Sew a pair of pajama pants. 37. I’m going to allow myself to purchase yarn with the condition that an equal (or greater) amount leaves the house. 39. Write recipes on recipe cards as needed. No more torn out from magazine papers! 42. Grow plant / veggie garden from seed. 45. Read “The Killer Angels”. 48. Clean out email inbox and maintain so there’s never more than 100 messages in there at a time. 49. 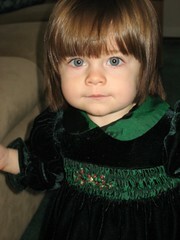 Get a professional portrait of Lorelai. Adorable. 52. Get back in shape to fit into my regular non-maternity clothes. All the maternity clothes are put away! 60. Make my own sushi. 61. Make photocards for Valentine’s Day, Easter, Halloween, Thanksgiving on home computer. 67. Garden indoors with the AeroGarden, maintain the water and nutrients. 68. Get a bikini wax. 73. Knit three projects from each knitting book I own. 75. Copy the phone numbers in my cell phone into my paper address book. 78. See if the nerds / geeks can rescue the data from the Dell hard drive. 81. Sort through the boxes brought home from school. 82. Fully update stash on ravelry. 83. Fully update books on ravelry. 84. Fully update needles on ravelry. 88. Knit Dan & Virginia’s wedding afghan. Deadline: June 2009. 89. Knit afghan for me! 91. Purchase a TerraPass / CO2 offset for my car / home / acrylic knitting. 96. Come in second in the fantasy football league. OMG, don’t want to jinx it but as of 11/4/08 I’m #1! I won!!! 98. Eat vegetarian for a week. 99. Learn to make pancakes. 97. Read more than just the Art section of the New York Times Weekend Edition (\2\4/143) – No time to read this anyway. 93. 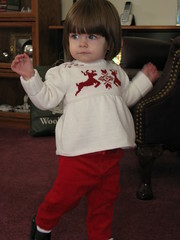 Embroider a onesie for Lorelai. – she grows too fast for those onesies. Make her a sweater. Or toys. 92. Knit all holiday gifts by December 13. – Not realistic for a knitter that thinks she’ll make more hats on Christmas Eve for gifts. My heart is a little heavy – two separate friends have had to deal with some rough news of family deaths, last week a local 15-year old committed suicide. Today clicking through my blogs I came across this post: here. That led me to this: To Write Love on Her Arms. I just want to give everyone I know a big hug. Does it happen any other way? The Holidays always seem to be a blur to me – we always travel. I have forever gone to Rhode Island and back to CT multiple times. Dan’s family is from Long Island. They always travel. For us it was RI on Christmas Eve, back to CT to do our Christmas, down to Long Island for Christmas, back to CT for another Christmas. I’m exhausted. It’s all good – everyone in the families gets along and it’s a good time – lots of food and interesting stuff like that – but I also feel like I missed so much of what I’m used to (sitting back and just observing family dynamics) – because either Dan or myself were watching Lorelai the entire time. Sure, everyone wants to see her, but they will turn away when she does, they aren’t watching her 3 steps ahead to see the full soda can in her reach, or the glass dish full of popcorn, or the knife… It’s all good though. Lorelai has decided she’s done with crawling. She just wants to move! She was appropriately spoiled – clothes & books & and noisy toys (that are tolerable) and a gorgeous handknit from Aunt Virginia that deserves its own post! I’m excited for a few gift certificates to LYSs and 2 new knitting books and the Yarn Harlot page-a-day calendar. I’m working on my knitting new year resolutions (I’m thinking about knitting 100 balls of yarn, personal sock club, etc). First off, a big big Thank You! to Amy – she had a contest on her blog and while I didn’t win, I was a close second! She sent me a great package! 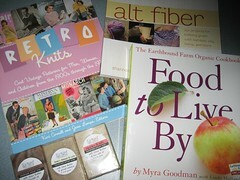 There’s the Earthbound Organic Cookbook that I can wait to try out in the next few weeks, RetroKnits – this book is a hoot! And I think I have found a few items to knit up! and altfiber – OMG, fantastic! And she sent three of the most fragrant soaps from Two Rivers Soap – they are fantastic, and reading their website – Fair Trade, Secret Pal friendly!! So of course, now I’m thinking of knitting soap sacks, in a retro pattern with alt-fibers! 🙂 Thank you again, very much Amy! 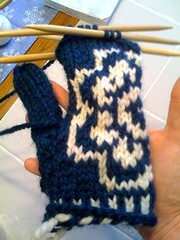 I was working on a pair of Plum Blossom Mittens for me! But, there are issues. They are a bit too snug (so I guess I’ll make the L instead of the M), the cuff needs to be longer and I think also a bit more snug there so I’ll go down a needle size. I haven’t given up on them, but they are in a time-out. 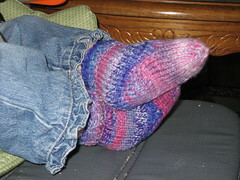 I finished all my Christmas gift knitting – wove in the last of the ends on the second pair of the hot-hands / potholders. I really want a pair, so I will make them eventually. I made Dan a hat and it worked up so quick that I was bit by the “I can make these for Christmas Gifts!” – Yeah, that was December 22. 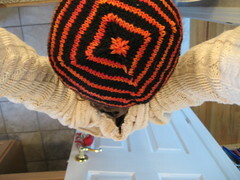 I did make 2 hats, but I was sidetracked by the ends to weave in that in the end we’re keeping both hats. For now. I have nothing but love for Brooklyn Tweed and the Turn A Square hat. Works up SO fast! 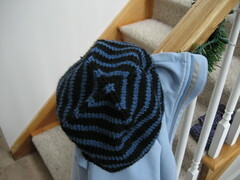 I used one skein of Lamb’s Pride to get the black for both hats! The blue is Cascade220 (Dan’s hat) and the other is a red-orange yarn I bought from a Farmhouse Yarn bin sale (no tags on the yarn). Love love love love! I think I’ll still make hat #3, the yarn is out and staring at me. Plus then I can call it “Cubed” (geek flag!). Anyway. And that’s that. I think we’re caught up! Yay! It’s cold out and we’re surrounded by 6-8 inches of snow and ice. I don’t mind, and I’m not complaining. I like New England winters – sure they are unpredictable, but when the first snowflakes start to fall it is just so pretty out! And as long as there is snow, it makes the cold worthwhile. 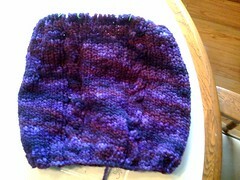 It was a good weekend for knitting – I started and finished my Abrazo from the Fall ’08 Knitty. I made the medium size / 36″ and it only took 2 skeins of Kathleen (colorway: Betty Friedan) – I have yet to go back and crochet around the arms / neck edges (I may just skip that) so I even have some leftover! And talk about a quick knit, I cast this on Thursday afternoon, had 11 inches done by the end of SnB and was weaving in ends on Saturday night. Sweet. I wore it all day yesterday – it’s just right – doesn’t feel bulky or anything! 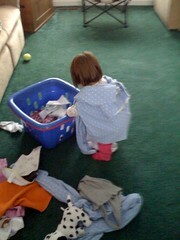 Lorelai has started, in her own way, playing dress up. Many times during the day she will put on a teething ring as a bracelet (most often the red one). We were folding laundry on Friday and she clung to my fleecey pajama top – so I draped it over her shoulders like a little cape and she seemed to like it. I hope it wasn’t that she was cold! I’ve gotten a bit of the crazy-last-minute-knitter bug – wasn’t planning on it, but I think I can get two (or 3) hats done so I’m knitting away like a mad woman. If it works I will rock! First off, Congrats to Theatreknitter and Piccologirl on their becoming “official” aunts! Not that they were any less special as Aunts to any of the children that surround them, but their sister had her baby, Patrick, yesterday! Yay for babies! Second, I’ve taken a break from my must-do knitting (super secret project, CPH sleeves, Dan’s hat, Christmas gift, etc) and cast on for Abrazo from knitty. 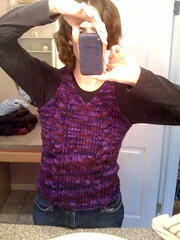 As part of my payment for knitting for Schaefer yarn, I received yarn to make this vest. I wound up one hank last night and ran out of yarn at SnB! I’ve got about 11 inches done already! Now I’ve got the bug and just want to keep knitting this to finish it! For the most part in the house I don’t put much on Lorelai’s feet – she tears off the socks anyway and she has better balance / grip when she’s barefoot. When we go out I do put tights / socks / shoes on her. I got her to wear little boots last night. 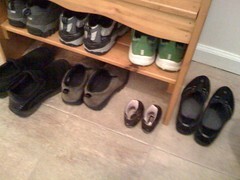 Dan brought her home and he put away her shoes with all the rest we I leave there. So cute!